It’s been many years since I grew Flowers for the sake of bouquets as well as for the sake of making Flower Essences. But this summer with a wedding on the horizon, my preoccupation with nosegays is noticeable. 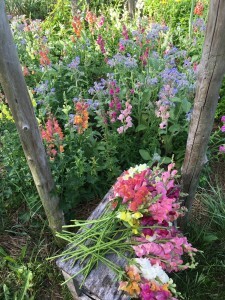 How does everyone here at the farm know that this summer I am fixated on Flowers in a different manner than usual? The first clue is that every flat surface in the house and office has a bouquet or two or six or eight on it, as well as a vast and motley collection of smaller vessels with rogue stems of various Flowers. An official Flower traffic jam is well underway. Here in this photo, the day’s collecting has begun. In the background the Sheehan men are looking “stressed” while chilling with their computers. Pretty much every Flower not intended for a Flower Essence now gets cut, plunked in one vase or another and scrutinized for longevity of bloom. 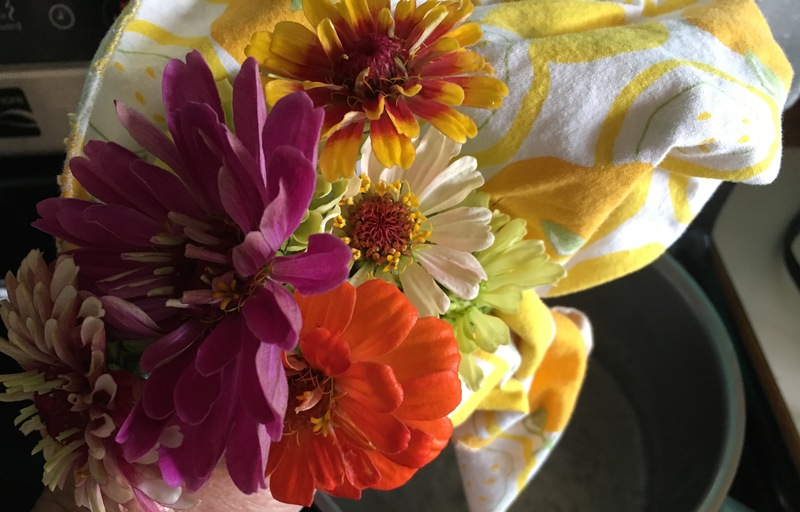 I harvest the annual Flowers in order to keep them blooming in the fields, BUT I also need to keep track of what happens to them and their perennial sisters after they are harvested. How fast do they wilt? Under what conditions will they be robust enough to make it from harvest to wedding festivity? What temperature water do they prefer after harvest? Do they need special conditioning like having their stems seared with a flame or bashed with a hammer? So many questions to ask. So many experiments to run. This is all code for my experiments in conditioning the Flowers so they will last from when I have to cut them on Thursday night/ Friday morning of the wedding weekend to when they have to strut their stuff on Saturday night. In any given growing season I have a thick folder of photocopied seed orders, notations about plants started in the greenhouse, designs for each garden, an enormous list of Flowers I need to make Flower Essences from and elaborate planting schedules. This year the folder is weighed down by several hefty documents about how to condition i.e. 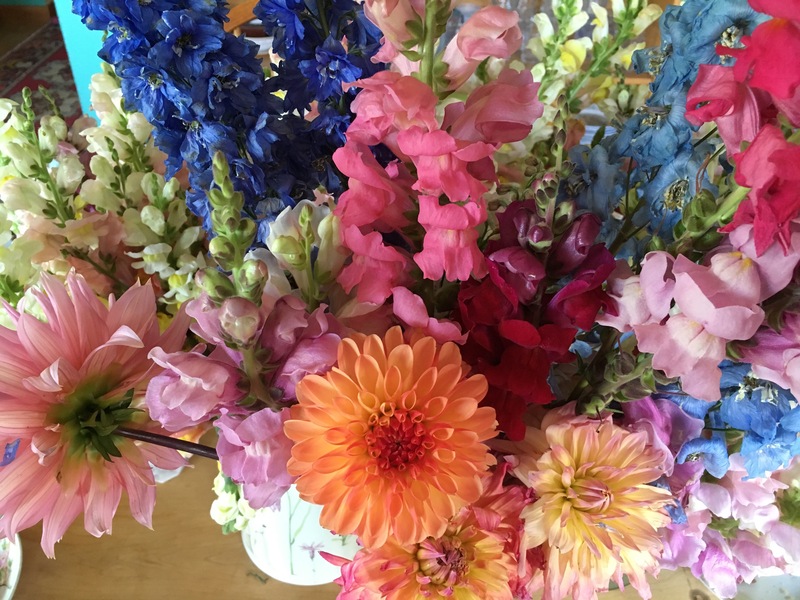 preserve cut Flowers after harvest. You’d think I could keep it to one’s experts list of specifics for Flower conditioning. But no, I noticed that experts disagreed about the best way to condition many varieties of Flowers, so I have several lists. 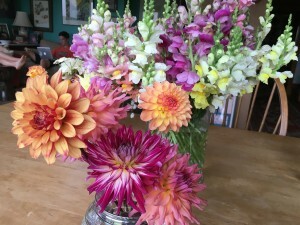 Like everything else in our age of information, there are a lot of vociferous differences of opinion about how to handle various cut Flowers (and even what constitutes a cut Flower). For example one document suggests cutting Dahlias in the cool of the morning then placing them in 160 -180 degree water for an hour wrapped in a towel to keep the heat off the blossoms. Another document suggests putting the stems in boiling water for a few minutes then plunging them into deep cold water. Through all my many decades in the garden, I mostly left Flowers to bloom right where they grew, then deadheaded them when they went by. This conditioning stuff is all new territory for me, so I am experimenting with all suggested methods. Here a small bundle of Zinnias get the quick stem boil technique before a night in lukewarm water. Of course, I ask the Elementals for advice. They seem more relaxed about the whole thing than me and suggest I water and feed the plants per usual and the rest will take care of itself. Their specific message is that there will be plenty of Flowers for the 10 bridal bouquets, the 25 table arrangements, the 12 boutonnieres, the 6 corsages, and the outdoor arrangements where the wedding is happening AND that pretty much all the Flowers will be fine for the 36-48 hours between when I pick them and when they are displayed. Okay, okay. Easy for THEM to say, but none of them are the mother of the bride! So I keep to my overly elaborate testing process. At lunch yesterday Jim moved a couple of bouquets to make room to actually use the kitchen table to eat his sandwich, and a post-it fell off one of the vases. “Do you need this?” he asked in his mild mannered way. DO I NEED THIS? YES I NEED THAT! IT’S MY BRAIN! AND WHICH JAR DID THAT FALL OFF? Let’s just say, I wasn’t as mild mannered in my answer as he was in his question. The poor man slunk out of the kitchen to eat his lunch SOMEWHERE far, far away from all my experiments. Was it the toolshed or the barn or another outbuilding where he retreated? I have no idea. I was trying to figure out which experiment had been jeopardized by his careless desire to eat lunch at the kitchen table!